Price Based on A5 Size NCR's, Single Colour Print. A4, A3 or full colour prices available on request. 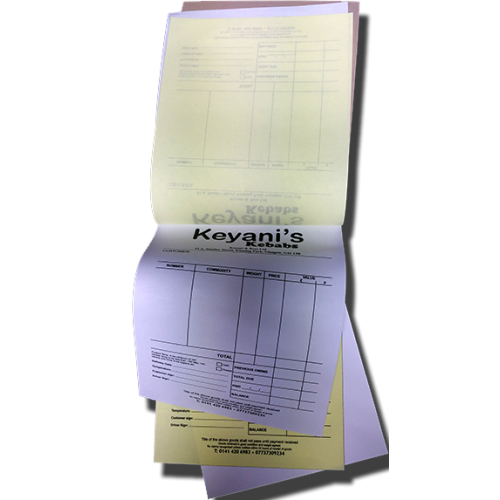 We offer DL, A5 and A4 NCR pads and all come with a choice of 2 part (duplicate), 3 part (triplicate) or 4 part sets (quadruplicate), with identical single colour or full colour print to all parts. 50 sets per pad with white top copy, yellow 2nd part, pink 3rd part (if needed) and green 4th part (if needed). No messy carbon is required as we print onto NCR paper, All pads are glued and supplied with a hard board back and loose writing shield. We offer sequential numbering and other popular optional extras as required.